Labouchere is a progressive money management system that allows you to make a profit even if you win less than 50% of your sports bets. If you are completely new to Labby, a good place to get started is here. To see how it works, let’s look at some examples. 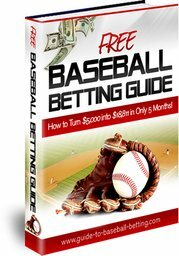 Let’s assume that you have a total bankroll of $10,000, which makes your first betting block $2,500. If you’re new to establishing betting blocks, see Bankroll Management. Since Labouchere is a progressive betting system, you increase the size of the wagers after a loss. A good starting bet is 2% of your betting block. Thus, if your betting block is $2,500, your first wager is $50 ($2,500 x 0.02). If using flat bets, I would recommend betting 5% of your betting block. You win game 1, so you cross off the two outside numbers (see Line 2 below). The wager for Game 2 remains at $50 (the sum of the two outside numbers). You lose Game 2, so you add $50 to the end of Line 2. The wager for Game 3 is now $75 (the sum of the two outside numbers). You win Game 3, so you cross off the two outside numbers. There is only 1 number left so you start over for Line 4. Final Labouchere line is x-x-25-x-x. The wager for Game 4 is $50 (the sum of the two outside numbers). You lose Game 4, so you add $50 to the end of Line 4. The wager for Game 5 is now $75 (the sum of the two outside numbers). You lose Game 5, so you add $75 to the end of Line 5. The wager for Game 6 is now $100 (the sum of the two outside numbers). You win Game 6, so you cross off the two outside numbers. The wager for Game 7 is $75 (the sum of the two outside numbers). You lose Game 7, so you add $75 to the end of Line 7. The wager for Game 8 is now $100 (the sum of the two outside numbers). You lose Game 8, so you add $100 to the end of Line 8. The wager for Game 9 is now $125 (the sum of the two outside numbers). You win Game 9, so you cross off the two outside numbers. The wager for Game 10 is $100 (the sum of the two outside numbers). You win Game 10, so you cross off the two outside numbers. The wager for Game 11 is $75 (the sum of the two outside numbers). You win Game 11, so you cross off the two outside numbers. There are no numbers left so you start over for Line 12. The wager for Game 12 is $50 (the sum of the two outside numbers). You lose Game 12, so you add $50 to the end of Line 12. The wager for Game 13 is now $75 (the sum of the two outside numbers). You lose Game 13, so you add $75 to the end of Line 13. The wager for Game 14 is now $100 (the sum of the two outside numbers). You win Game 14, so you cross off the two outside numbers. The wager for Game 15 is $75 (the sum of the two outside numbers). You lose Game 15, so you add $75 to the end of Line 15. The wager for Game 16 is now $100 (the sum of the two outside numbers). You lose Game 16, so you add $100 to the end of Line 16. The wager for Game 17 is now $125 (the sum of the two outside numbers). You win Game 17, so you cross off the two outside numbers. The wager for Game 18 is $100 (the sum of the two outside numbers). You win Game 18, so you cross off the two outside numbers. The wager for Game 19 is $75 (the sum of the two outside numbers). You lose Game 19, so you add $75 to the end of Line 19. The wager for Game 20 is now $100 (the sum of the two outside numbers). You win Game 20, so you cross off the two outside numbers. There is only 1 number left. Final line is x-x-x-x-50-x-x-x-x. If there was a line 21, you would start over at 25-25-25-25. The two tables below compare the results of the Labouchere System to Flat Bets. Note that while Flat Bets shows a loss of -4.5%, the Labouchere System shows a profit of +5.5%. This demonstrates the power of the Labouchere System. For some closing thoughts on the Labouchere Betting System, click here.